Next season Lewis Hamilton will be the second oldest driver on the F1 grid while one of his main rivals will have just turned 21, and he is relishing the challenge. Turning 34 in January, five-time World Champion Hamilton will be the second oldest driver in Formula 1 after Kimi Raikkonen. The Finn, who will race for Sauber next season, hits 40 in October. While this season Hamilton fought a fellow 30-plus driver in Sebastian Vettel for the World title, next season a few youngsters could join the battle. Max Verstappen, who celebrated his 21st birthday a few weeks back, is being billed as a possible contender while his 2019 Red Bull team-mate Pierre Gasly is 22. Added to that there is also Charles Leclerc to consider with the 21-year-old heading to Ferrari to partner Vettel next season. “I welcome the competition, naturally,” Hamilton told Sky Sports. “I do see a little bit of myself within them, being at their age I had the same kind of ‘eye of the tiger’, I would say, I guess. “But I guess now it is a little bit different for me being that I am one of the older drivers. “But I feel like I still have that hunger that I guess that they are coming in with. “But backed with experience which – I don’t know how you guys feel in your job – but in my job experience – and I am pretty sure it is the same in yours – there is no substitute for that. 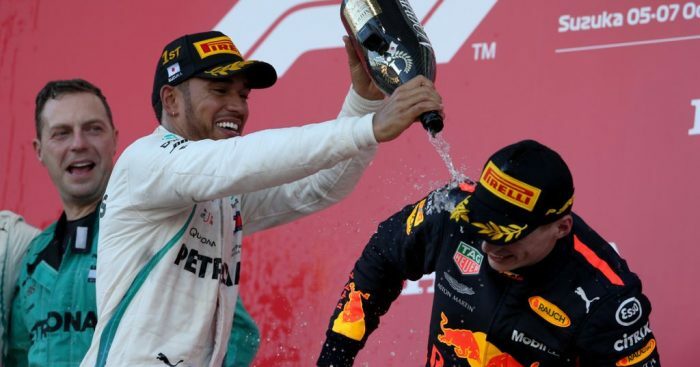 Last time out in Mexico, Hamilton became only the third driver in F1 history to bag five World titles when he claimed an unassailable lead over Vettel in the standings.